Naturally lift your energy level with ginseng. The active agents in Panax ginseng are ginsenosides, a group of saponins, which help the body adapt to various stressors. 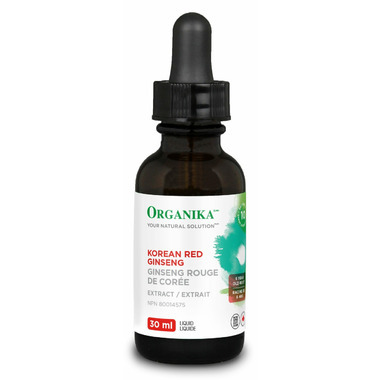 In periods of fatigue, choose Organika's Korean Red Ginseng to increase your energy level. Recommended Dosage: Take 1 ml (15 drops) 3 times daily. Caution: Consult a health care practitioner prior to use if you have diabetes; if you are taking antidepressant medications, blood thinners or digoxin; or if you are pregnant or breastfeeding. Some people may experience insomnia, anxiety or headaches, in which case, discontinue use.